I’m thrilled to welcome Heather Huffman, who has graciously taken the time to answer the usual battery of questions with her wit and charm. Heather has several novels under her belt, with her latest, Ring of Fire, to be released by Booktrope. Heather isn’t afraid to write about some pretty tough subjects, and Booktrope is happy to give her a platform. I think you’ll love what she has to say, so spend a few moments with her here. You may find your next favorite author. All of my books are about strong women with incredible strength and passion, who face seemingly insurmountable odds. 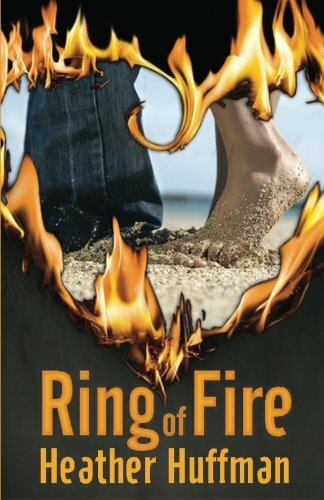 In my latest release, Ring of Fire, a scientist stationed on a remote island to research green energy stumbles upon a young girl in danger, and suddenly finds herself thrust into a situation where she has to protect not only her life’s work, but also her life itself. Add a healthy dose of love, adventure, and humor – and an annoyingly handsome government official – and you have Ring of Fire, an entertaining and romantic journey that reminds us things aren’t always as they seem. I don’t remember a time when I wasn’t writing. The first thing I ever wrote that I still have and like was a screenplay I finished when I was 13. It was about a young woman in the 1800s who dressed like a boy and hitched a ride with a band of outlaws heading west so she could find her brother. I still think I’d like to clean that up and turn it into a novel someday. When I first started submitting novels, I got the form letter back and I knew my work wasn’t ready. I learned from the rejections and got better. When I was having drawn out conversations with agents, I knew the problem was no longer my skill level, it was finding a niche for my work. When an agent told me point-blank that she loved the writing in Jailbird, but a story like that would never be published mainstream, I knew I was faced with a decision. I thought about it for a few days but ultimately decided I’d rather be true to the stories in my head than write to please a publisher. So I decided to go indie with the four novels I’d already written. Sharing my books with others on that level was an amazing experience. I’m forever grateful to the readers who reached out to me in that first year. When I was contacted by Booktrope, I was hesitant to sign with a publisher. I’d been rather spoiled by the level of control I had with being indie. I’d also been contacted by someone who felt I should be seeking mainstream representation again. I found myself with three choices laid out before me: stay indie, go with a small publisher, or get back in the New York game. I’m thrilled I chose door number two. Booktrope is the best of both worlds; I can’t say enough how proud I am to be one of their authors. I am, and it’s a project I’m really excited about. Devil in Disguise catches up with a few characters from my other novels. Conrad Langston, the hero for book six, was first introduced in Jailbird. Rachel Cooper has appeared in almost all of my other novels, even if it’s just a passing mention. She’s finally getting her own story – her little sister goes missing and Rachel stops at nothing to not only save her, but set her family’s life right again. Of course, she gets a little help from Rick and Veronica Sinclair – the main characters in Suddenly a Spy. I’m having a lot of fun with this particular crew. Devil in Disguise, like many of my books, addresses the issue of human trafficking, a cause I’m passionate about fighting. I try to use all of my books to be a voice for the voiceless in some way, but this one really shines a spotlight into some of the lesser-known aspects of the fight. Each book gets its own soundtrack, and I listen to it constantly while I’m working on that book – I mean, in the car, while I’m washing dishes, going to sleep at night. It helps me keep the vibe of the book top of mind. Sometimes when I sit down to write, I have the scene playing through my head like a movie on a reel. Sometimes I have no clue what I’m going to say and my fingers just move of their own accord, surprising even me with what they come up with. I do always have either a cup of coffee or a Diet Coke at my side when writing. I try not to snack – as often as I’m at the computer, I’d be the size of a house if I did. If I do sneak something, my weakness is definitely M&Ms. A friend of mine has a shirt that I covet. It reads “Careful, or you’ll end up in one of my novels.” Characters are usually mixtures of many people I know. The heroine always has some aspect of me in her – usually her flaws and pain. It’s easier to make those come through if they’re genuine. Three come to mind, though, that are pretty closely based on a real person. The first is Danny, from Throwaway and Ring of Fire. He’s based on a St. Louis musician named John Bartley. I find John’s music both fascinating and moving. He’s extremely talented, and he’s also a very kind and interesting man. I first heard his music when I was researching settings for Throwaway. At the time, it just so happened that he played at two pubs I’d picked out to be in the book, so it seemed natural to work him and his music into the story. The other two are Kate’s friends in Ties That Bind. Kate is the embodiment of my insecurities, and her two amazing friends are based on two young women I worked with when I wrote that book. Like Kate, Liz and Jessica, the three of us had become instant friends. These young women were the ones who encouraged me to share my writing with the world again. They were the first ones to hear the dreams that led to Throwaway and Jailbird. I think that’s the soft spot I have for Ties That Bind. More than a love story between Kate and Gavin, it’s the novel that stands testament to the friendships that changed my life. Green, although I never remember to take it with me. Nathaniel Hawthorne. I read Scarlet Letter when I was in the 6th grade and it’s had an impact on the way I live my life. One statement in particular has stuck with me through the years: “Be true. Be true. Be true. Show freely to the world, if not your worst, yet some trait whereby the worst may be inferred.” It’s become my motto in life. Having your fears and sins out there for the world to see removes the fear that they’ll be found. As for contemporary authors, it would have to be Sylvain Reynard. There is something very lyrical and beautiful about his writing. Honestly? The Bible – I read it with my boys almost every night. The most recent novel I read was No Time to Cry by Rose Campion. All of the above. I love to travel, and I take notes when I do because I prefer to write about places I’ve been. It feels more genuine. If I have to rely on research, I try to find someone I know who’s familiar with an area to help bring details to life. The first thing that happens when the last word is written is a moment or two of me staring at my computer screen incredulously, as in, “Wow, I actually finished it.” Then it goes to my mom, sisters, and/or nieces for the first pre-read. After that, a couple of people on the Booktrope team help point out any holes that need to be plugged in or edges that need to be smoothed out. Finally, it goes to a Booktrope editor for another round of polishing. Like each of my books, Ring of Fire had its own playlist. There is the obvious, Ring of Fire – John Bartley’s version or the one by Social Distortion, depending on the day. Joey by Concrete Blonde was another good one. Borderline by Eliza Gilkyson completely captures Alex’s hesitation when it comes to Daniel. Of course, all of my books have a little Springsteen on their soundtrack. For this one, Tougher than the Rest still makes me want close my eyes and be transported back to Alex’s world. The usual suspects – online retailers like Amazon.com, BN.com and iTunes are the best places to grab a copy. Autographed print copies will be available at my appearances as I travel the country for the Leave Your Mark tour – details for that can be found on my website. Absolutely! It was hard for me to pick one scene, but this one made me giggle when I wrote it. Poor Alex has had a heck of a day – she’s braved hired goons, the jungle and explosions to rescue a princess whose irritating-yet-handsome guardian questions her motives. In this scene, she’s trying to wash away the grime and stress of the day by submersing herself in the luxurious palace bathtub, which is filled with scented oils and flower petals. In fact, the tub is so full of flowers that the aforementioned guardian hops into the tub with her before he realizes she’s even there. “What are you doing in here?” Daniel Martin demanded. She couldn’t help that last little jab. His jaw twitched and she was pleased to know she’d succeeded in once again irritating him. You can preview the first four chapters for free on Amazon. You can also follow Heather on Twitter and check out her profile on GoodReads. Thanks for reading, and I hope you enjoy Ring of Fire!